From almost the moment I woke up, I was on my feet – I had a baking agenda, though I didn’t do everything that I’d planned. I baked three batches of chocolate chip cookies, three different recipes – one a variation – and gingerbread – something that I’ll be sharing next year, since I think it would be off-kilter to post a recipe for such a thing after Christmas. The smell of chocolate chip cookies and gingerbread permeated the house. I hope everyone had a great Christmas, with more than enough food, family and friends, and Christmas cheer all around. It’s those chocolate chip cookies that I baked that morning that I’m sharing here today. The third batch I’m holding on to a bit longer since I want to play with it a bit more and fine tune it, but I can already say that they’re my Dad’s favourite. 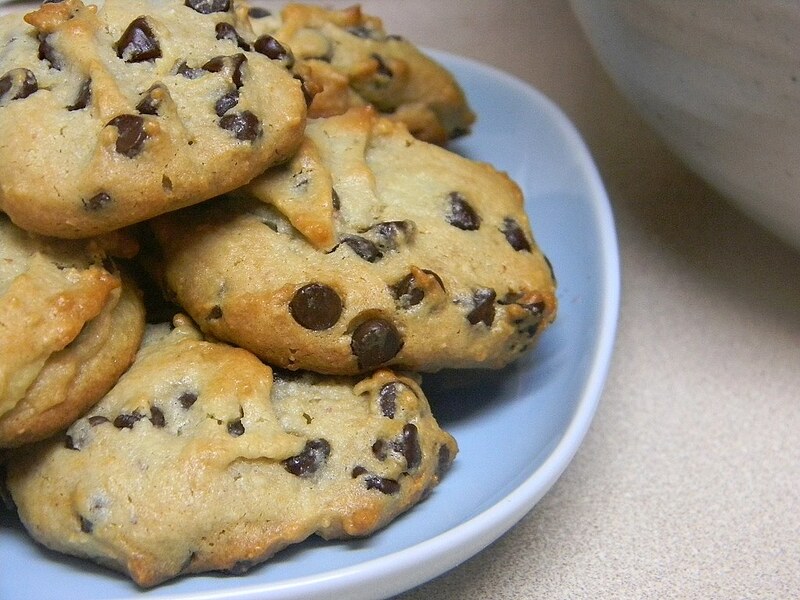 This particular chocolate chip cookie recipe comes from Alton Brown. To be honest, I had hardly a clue about who Alton Brown is – I confess I didn’t even recognize his name – until not too long ago and I’ve since come across a number of blogs singing praises to the heavens about his recipes and how they work. 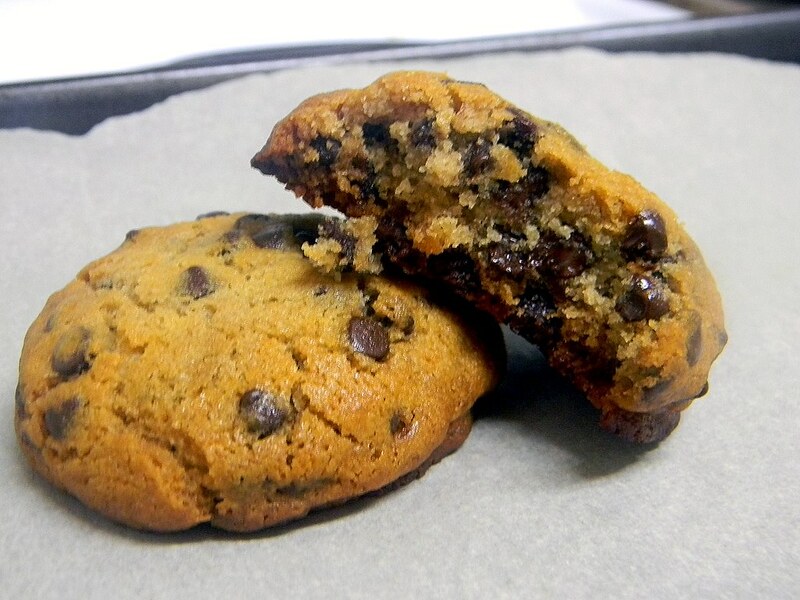 It was while I was researching, once again, the chemistry of chocolate chip cookies that I came across Mr. Brown’s three recipes for chocolate chip cookies. I don’t remember how it happened or started, but lately I’ve been having seemingly an obsession, for lack of a better word, with chocolate chip cookies. I pore over articles about them, including that New York Times article with the thirty-six hour dough that had food bloggers in a frenzy, and study all the varieties that are out there that are inevitably tied to Ruth Wakefield. Sometimes, my interest is not so much in eating them but learning about the chemistry that makes a good chocolate chip cookie. Such personal quests are sometimes a pain since I want to go right down to the very science of it and that can’t always be easily found or answered with a few clicks of a Google search. Soon enough, I came to find Alton Brown’s recipe for gluten-free chocolate chip cookies. Delving further into this recipe, it turns out that it is adapted from one of his three chocolate chip cookie recipes: the chewy, I believe. I made the cookie dough the night before, on Christmas Eve, and baked them on Christmas morning. They seemed promising, I was hoping I’d be one of the thousands standing and clapping in ovation, but once I tasted one, I wasn’t completely happy. The cookie itself was of a pleasing sturdiness, it was chewy, but all the while as I ate it I thought something was lacking. I became full after just one cookie – that in itself not a bad thing, except that this feeling of being full was not satisfied but ugh, like it was just sitting there. Most of my gripes seemed to be idiosyncratic, however, as almost everyone else liked them. My aunt loved them – may I tell she ate four in a row? – even to the point of employing one of the oldest tricks in the book: to exclaim and point at something non-existent and, while everyone’s backs are turned, take the last cookie and run. Cheeky! I made the cookies again on the same day, with different flours – thinking that the blend might be the solution. These cookies turned out flatter than the original – well, as original as I could get substituting the butter with Earth Balance – but didn’t have that same feeling as after eating one of the cookies from the first batch. Or maybe that whole thing was just me. They spread out, unlike the ones made with brown rice flour and cornstarch. The Nightmare Before Christmas, anyone? Don’t mind the black lines on my hand – I was testing Lauren Luke’s eyeliner. The only person, besides myself, who wasn’t so fond of either batch of cookies was my Dad who prefers the chocolate chip cookies that I made before (my Dad’s favourites, I mentioned, and that I’m not ready to share yet but you may feast your eyes to your heart’s content until then and the recipe is posted here). Although I’m including the full recipe here, I cut the recipe in half the first time I made it and I measured the flours with cup measurements, then weighed them. I don’t know if that’s the proper way to convert measurements but that’s what I did. For the brown rice flour, I didn’t do exactly 1 cup. And for those curious, I spoon the flour into the cup – as all bakers know, even how you measure a cup of flour can affect the weight as well as other things such as aeration. For the eggs (1 whole egg and 1 egg yolk), I used large and, yes, I halved both of them. 1 large egg is generally 1/4 cup, so I beat it just enough to mix the yolk and white together then measured out 2 tablespoons worth, thus half of an egg. For the egg yolk, I first weighed it – this is sounding so nerdy – and then mixed it and measured half of its weight to add to the batter along with half the whole egg. The rest of the egg yolk I used in another cookie dough I made later. General guidelines state that a large egg yolk weighs 19 grams, although it is best to weigh it yourself as well. The egg yolk that I used weighed 15 grams, so my half recipe measurements reflect this. Since gluten-free baking is built on precision for the most part, I am including my key measurements for the half recipe if you want to go the same route. Unfortunately, I forgot to weigh the flours for the alternate flour blend, though I think that’s forgiveable. Also, if you have just one pan for cookies, don’t just plop more dough on it as soon as you’ve taken the baked cookies off. It’s best if your cookie sheet is cold before you put more cookie dough on it as a hot pan will actually start melting the dough before it’s got a chance to properly bake. Rinse the cookie sheet with cold water (I run the water on the outside of the pan, so I don’t have to dry it before putting the parchment paper back on). Or, if the pan is cooled enough depending on how long it’s sat out since you took it out of the oven, stick it in your freezer for about 5 minutes or so. *I used extra cornstarch because I didn’t have any tapioca starch on hand, although even this – substituting tapioca with cornstarch – does affect the outcome of the cookies, according to this fascinating post about these same cookies but digs more into the science of these cookies and how these gluten-free substitutions work than I am. If you have tapioca starch, use 1/2 ounce or about 2 tablespoons. Whisk the dry ingredients, except for the chocolate chips, in a bowl. Melt the Earth Balance in a small pot over medium heat. Remove from heat and cool slightly. Mix in the honey and add the egg, egg yolk, milk of your choice, and vanilla extract. The batter will be a viscous consistency similar to thickening gravy or treacle. Gradually sift the dry ingredients into the wet ingredients, mixing with a spatula or spoon until completely mixed. Add the chocolate chips, gently stirring in. Cover and chill in the fridge until firm, about 1 hour [I have also left it to chill overnight with successful results]. When you’re ready to bake, preheat the oven to 375ºF. Line a baking sheet or cookie sheet with parchment paper. Shape the dough into 2-ounce or 1 1/2-inch balls with your hands or a #40 cookie scoop if you have one. If you’re using your hands, be sure to chill the balls of cookie dough a little bit to regain their firmness as your body heat warms and softens the dough. You should have 6 balls of dough on the sheet. Bake for 14 minutes, rotating the pan halfway through to ensure even baking. Remove from oven and cool on the pan completely before picking up the cookies, allowing them to set or else they will crack and or fall apart. Enjoy! This recipe is a half recipe of the one above, as I made it. Gradually sift the dry ingredients into the wet ingredients, mixing with a spatula or spoon until completely mixed. Add the chocolate chips, gently stirring in. Cover and chill in the fridge until firm, about 2 to 3 hours. The dough will not be as thick or stiff as the cookie dough made with brown rice flour and cornstarch. Plop 2 tablespoons of dough per cookie on the prepared sheet, spacing 1 to 2 inches apart. You should have 6 plops of dough on the sheet. Bake for 14 minutes, rotating the pan halfway through to ensure even baking. Remove from oven and cool on the pan completely before picking up the cookies, allowing them to set or else they will crack and or fall apart. They firm up more and dry out as they’re left out. Enjoy! Hello Miss Kitty, let’s not mention the two chocolate chip cookies you hid. 😉 Are they still hiding or have they since been eaten? I’ll need to do an express order for you! Cookies? What cookies? I even threw out the bag so there was no evidence of you having packed them for me in the first place! I love Alton Brown’s recipes. I usually watch him on the food network but I have never heard of this recipe from him. Thanks for posting this because I have to try it. 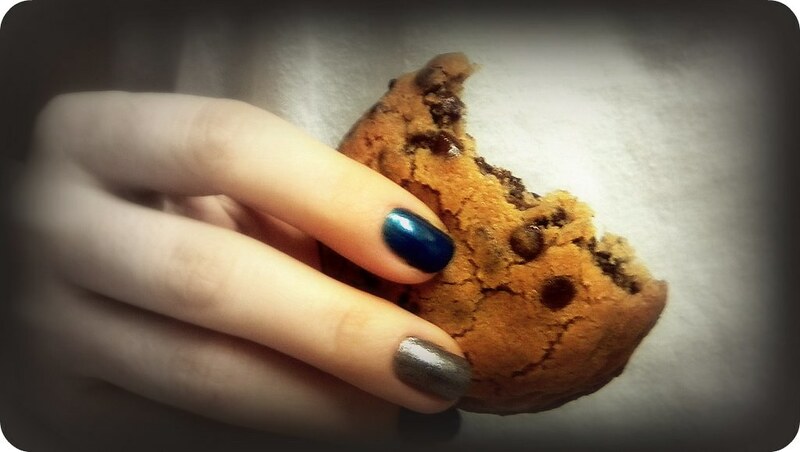 Love the nails 🙂 And I also LOVE chocolate chip cookies. I can’t wait to see your version. I’m going to have to go google Alton Brown (shhh don’t tell anyone). Hi Maggie, thank you! I look forward to sharing my version as well. 😉 Like I said, I wasn’t really that aware of Alton Brown in the slightest – what I’ve seen of his show are YouTube clips, since we don’t have cable. Hi Shirley, thank you. You flatter me. I wish you could have been part of the test tasting party, too – one day! This was the first Alton Brown recipe I made and I think that since he uses science to explain and demonstrate it kind of brought the geek out of me: otherwise I seriously don’t think I’d have been so crazy as to measure half an egg yolk and everything else I did. Such a cute story about your aunt! I think those cookies look delicious, and you can definitely share that gingerbread recipe if you want! I know what you mean though…I want to share a turkey pot pie recipe that would be much better for Thanksgiving than post-holidays, but unfortunately I didn’t have the recipe ready until now. Hi Iris, thank you! My aunt is definitely crazy about these cc cookies. I know what to make for her now. 😉 Turkey pot pie sounds amazing: pot pie is something I’ve yet to make…I think even something I’ve yet to eat. I remember always eating sweet pies but I don’t think I’ve had any savoury. I love reading your experiments. Gives me inspiration, for sure! Hi Ellen, thank you. I’m glad I give inspiration and that you like reading about my experiments. It’s a reassurance for those times when I think that I’m getting too technical or going into too much detail before the actual recipe, but I like reading about that kind of stuff – perhaps why Cook’s Illustrated is one of my favourite mags just for the detail they sometimes get into.